Hindus believe that all living beings pass through endless cycles of birth, death, and rebirth, and that good or bad behavior is rewarded or punished by reincarnation into either a higher or lower form of life. Their pantheistic all-god Brahma contains a whole world of deities, spirits, and other objects of worship. Hinduism embraces nature-worshippers, fetish-worshippers, and demon-worshippers, and does not scruple to permit the most grotesque forms of idolatry and superstition. Buddhists seek to escape the cycles of rebirth by extinguishing all forms of desire, including attachment to conscious existence, thereby attaining the blissful state of nirvana. This demands the practice of self-negating meditation and asceticism. There are various sects of Buddhists: some who worship Buddha as supreme personal deity and others whose deities are innumerable and idolatry unlimited. 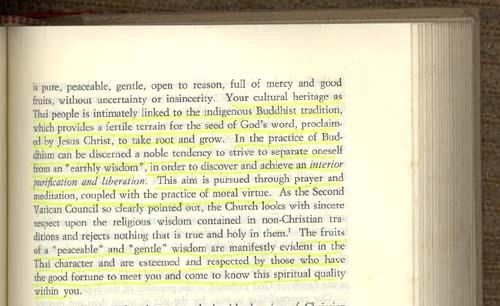 It is obvious that both the Buddhist and Hindu doctrines and methods are irreconciable with Catholic doctrine. Notwithstanding, in the homily of his Mass in Bangkok, Thailand on May 10, 1984, John Paul II praised the 'wisdom' as well as the 'interior purification and liberation' of Buddhism. 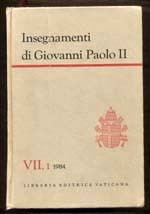 At right, is the cover of volume VII of the teachings of John Paul II in its official edition by Libreria Editrice Vaticana. 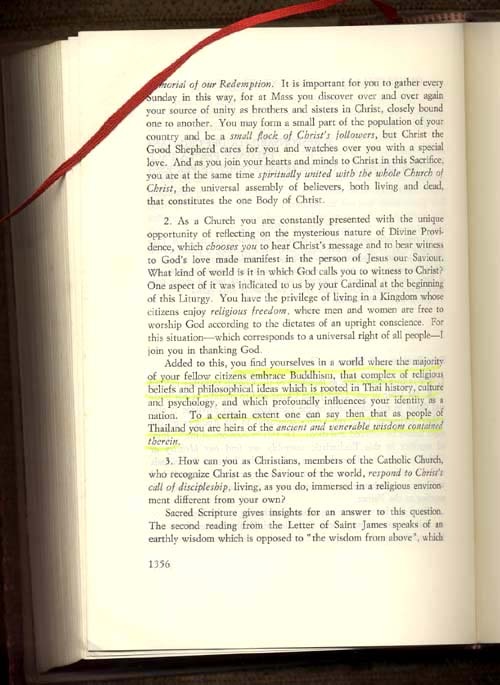 Below, we reproduce two pages of his homily in English where the mentioned eulogies are highlighted in yellow.